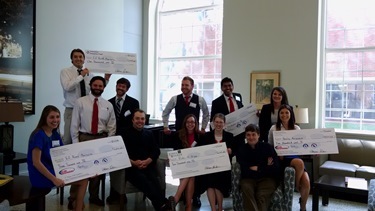 A total of $12,500 in cash and prizes were awarded last week to the most innovative, student-developed product and service ideas at the 2016 TOP DAWG New Venture Championship at Louisiana Tech University. Awards were presented to the top three finishers in the competition with the “EZ Read Monitoring System” team (mechanical engineering majors Rhodes Moran and Ryan Frick, and entrepreneurship majors Fran Ewing and Vincent Moore) earning first place honors and $3,000 for their easy-to-use devices that wirelessly transmit water level data to customers. The team also won the Innovation Enterprise Fund award of $1,000 given for entrepreneurial spirit. Winners from the 2016 TOP DAWG New Venture Championship at Louisiana Tech. Second place and a $1,500 award was presented to Bharat Karumuri (biomedical engineering graduate student) for his new venture “IntelliPace,” which is developing an embedded software module that enables programmable implantable brain stimulators to stimulate with high therapeutic efficiency and fewer side effects. “Healing Movement” (entrepreneurship majors Sierra McGraw and Logan Evans, nanosystem/electrical engineering major Abdullah Nammari, nanosystem/chemical engineering major Dustin Savage, and nanosystem/micromanufacturing major Seth Doughty) earned third place honors for developing a self-powered device designed to be placed inside a dental implant screw to produce electric stimulation to the jaw to promote bone growth around dental implants. The $2,000 Jones Walker Entrepreneurial Spirit Award, funded by Jones Walker and recognizing the team with the most entrepreneurial spirit, went to “Bike-n-Bright” (entrepreneurship major Andrea Harris and nanosystems engineering majors Zachary Hanson, Andrew Rigley and Karen Rispone) for their lightweight, easy-to-use, low maintenance bike light power supply system. In addition to the cash awards, the Louisiana Tech Enterprise Center sponsors six months of business incubator space to the winning teams, valued at $4,500. Seven multi-disciplinary teams earned a spot in the 2016 New Venture Championship final round. Teams were scored on the quality of their new venture investment deck and presentation as well as the overall viability of their business concept. The TOP DAWG was established in 2002 and is coordinated by Debbie Inman, director of the Center for Entrepreneurship and Information Technology. Members of Bulldog Entrepreneurs, the student organization which empowers entrepreneurs and promotes innovation on the Tech campus, serve as facilitators for the event. The New Venture Championship is held each spring quarter and provides an opportunity for students to create business investor decks based on ideas presented during the fall quarter TOP DAWG Idea Pitch. During the competition, each team is mentored by business experts and attends training sessions designed to help teams build their investor decks. The competition is an integral part of the Enterprise Campus’ focus at Louisiana Tech. Judges for the TOP DAWG New Venture Championship include Michael Leachman, partner with Jones Walker; Blair Suire, associate with Jones Walker; Ammen Jordan, City of Ruston; and Adam O’Neal, business development/commercial portfolio manager for Origin Bank. Supporting sponsors for the TOP DAWG include the Louisiana Tech College of Business, Louisiana Tech College of Engineering and Science, the Center for Entrepreneurship and Information Technology (CEnIT), the Louisiana Tech Enterprise Center, the Innovation Enterprise Fund and the Technology Business Development Center (TBDC).